CTET 2018 Application Form Correction – CBSE has started CTET Application Form Correction facility. The correction window can be accessed from September 06 to 15, 2018. If you have submitted the application form and now wish to edit some detail(s) in the application form, you can do it from CTET edit form, in online mode. 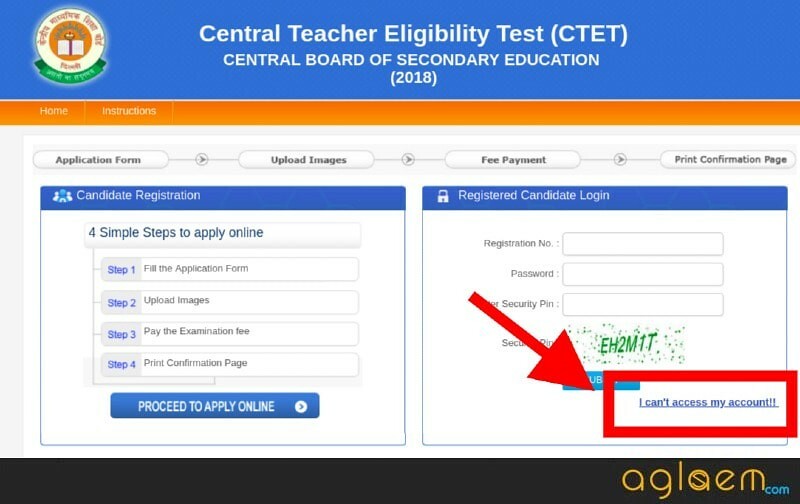 To change the details in the CTET 2018 Application Form, you need to log in at ctet.nic.in by entering details such as registration number and password. The window for making an online correction in the CTET Application form is open for a limited time period only. No change will be accepted through offline mode i.e. through fax/application or by email etc. Check complete details on CTET 2018 Application Form Correction from this page. Latest: CTET Application Form Correction has started. Edit your application from the link below. Though you are provided with the facility to edit details in the application form, however, you will be able to edit only a few information. The facility to edit the form is provided only once. Check the complete schedule for CTET Online Form Correction 2018 from the table below. 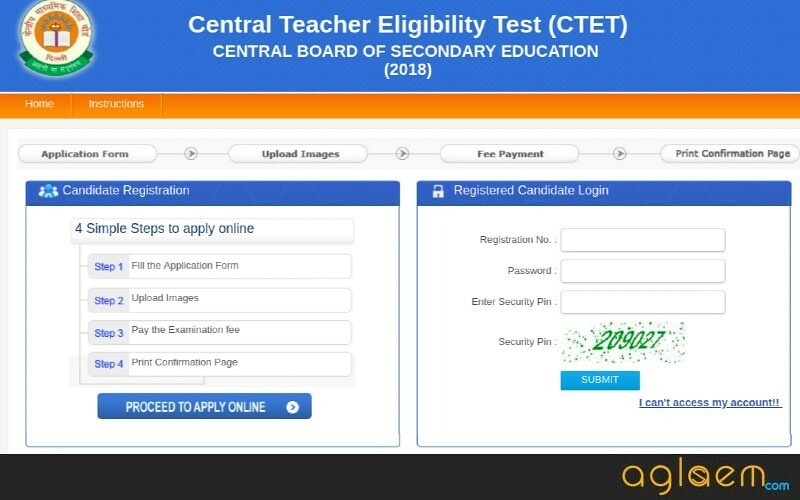 The CBSE released a modification in the eligibility criteria for CTET 2018, making B. Ed teachers eligible to apply for Paper I. Hence, as per the notification, the exam conducting body has decided to allow the filling of online application forms for Paper I of candidates again from September 6 to September 15, 2018. 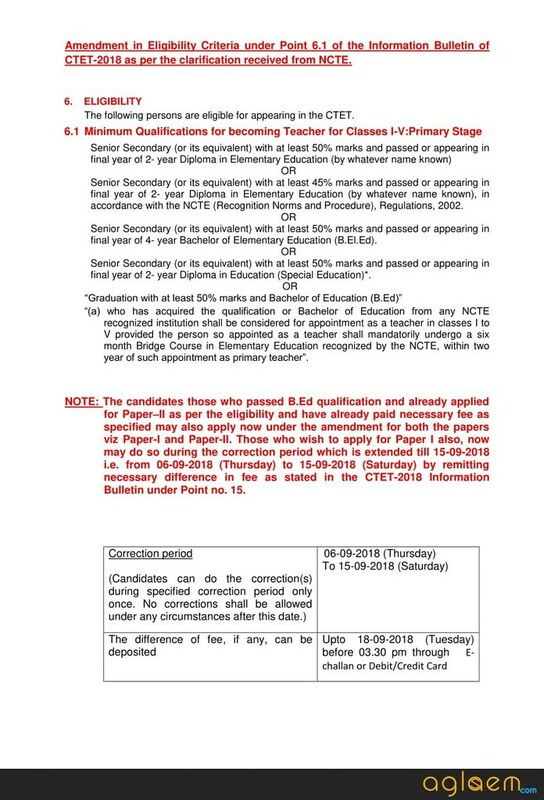 This means that the candidates those who passed B.Ed qualification and already applied for Paper II as per the eligibility and have already paid the necessary fee as specified may also apply now under the amendment for both the papers viz Paper-I and Paper-II. Which Details Can Be Edited in CTET 2018 Application Form? Name of the Institution/ College/ University from where you have obtained your B.Ed Degree/ Diploma in Elementary Education etc. How to Edit Details in the CTET 2018 Application Form? Click on the direct link which will be given on this page as soon as the editing facility starts. Next, you need to enter details such as Registration Number and Password. Before finally submitting the application form, you must verify that the details are correct. Lastly, submit the form online. 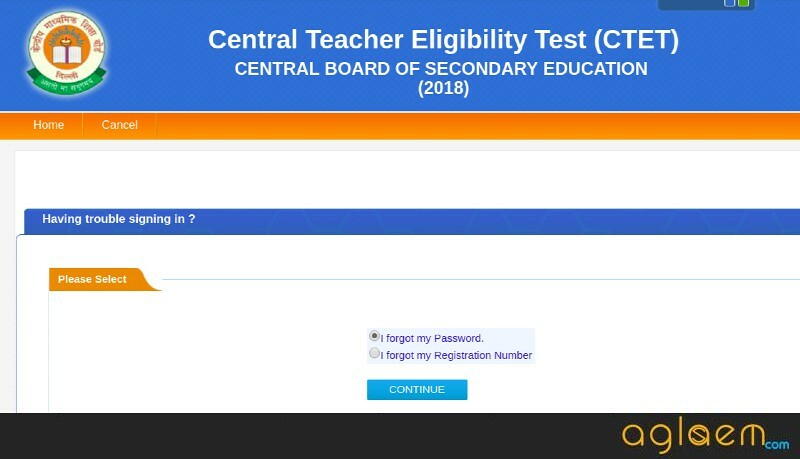 How to edit details if forgot CTET 2018 Registration Number/ Password? On the login page, click on the link for “I can’t access my Account”. If you do not remember your Registration Number/ Password, then click on the appropriate option. Using a reset link sent via email to the registered email id. Finally, click on “Submit” button and your registration number will be available on the screen. Q. I have paid the registration fee and submitted the form as well, but then I noticed that I have entered the incorrect year in date of birth. How can I edit it? A. You can edit the date of birth in the application form from September 06, 2018. 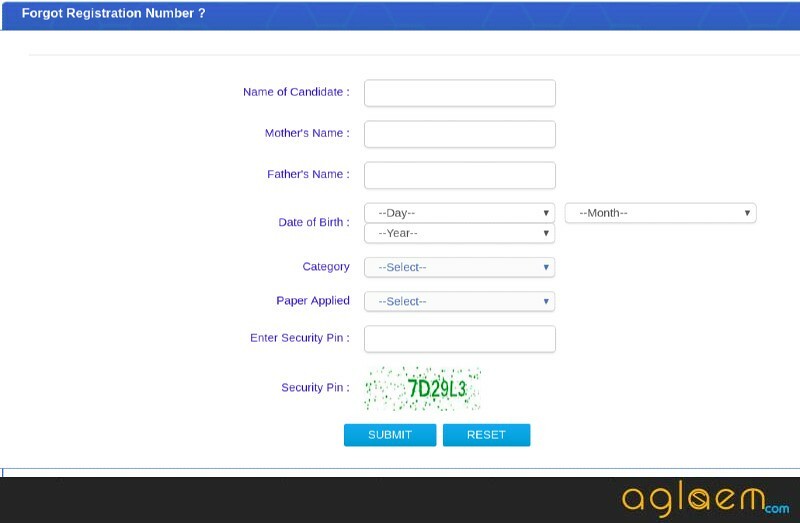 You will be able to edit the details by online mode only through Candidate Login. Q. Is there any fee charged for editing details in CTET 2018 Application Form? A. No fee shall be charged for making corrections in the Application form. Q. Is the CTET Form Edit a one-time facility or can I edit the details in the application form as much as I can? A. No, it is not a one-time facility. You can edit the details until September 10, 2018, anytime you want to. However, you must edit the details before the deadline. If you have any queries about the CTET 2018 Application Form Correction, then let us know in the comment section below. ave paid the registration fee and submitted the form as well, but then I noticed that I have entered the incorrect qualification for ctet 1. How can I edit it? Hi I already applied for paper 1 n now I want to apply for paper 2? When I can do that how I can pay extra amount for the same? I have not registered me for ctet2018 due to some personal reasons….is there any opportunities for registration..?? If you entered incorrect qualification in application form then don’t worry you can edit you application form . The Facility for making a correction in the CTET 2018 Application Form starts from 06 September. And I have applied for only one paper(paper-2 ) if I get chance to apply both or not…. The size of the photograph should be between 10 to 100 KB and if your photo size is between 10 to 100 kb then your application form will be submit successfully. I have done bsc bed .but i have applied for paper1 in ctet. Is it possible? i have applied for paper II. but latter in edit notification I am eligible for paper I also. can I opt paper I also in edit duration. I’ve submitted my application form for ctet 2018 as well,but by mistake my question paper medium has been changed into Hindi instead of English. Can I make a change in it? I have applied for both papers and paid the required fees for both but i couldn’t get the final submission message and registration number and password through phone number or email….what to do sir? Login will be start today . Once the login link is activate then you can make changes in your application form. I have already registered the paper second but i want to fill paper first also.how can i fill plz suggest. CTET application form correction is available now. Yes you can apply for paper first also. CTET application form correction link is activated now . You can edit your qualification in your application form. In this case you can contact official by phone or e mail. I have done Correction in Ctet Form but I was confused in Paper 1 option and mistakenly I have opted option no. 4 as I have to fill option no.6 . What to do? Yes you are eligible now to do changes in your application form. You can apply for paper one also. CTET application form correction link is available now. Now you can made changes in your application form. Don’t worry now you can correct your application form. CTET application form correction link is activated now. can any one provide link where i correction my ctet form..
Sir I’m pursuing B.Ed 2nd year.but I have registered for both paper 1 &2 .If I am eligible for paper 1 or not. I want to change my exam centres in the form, Is it possible to do ?? Is the CTET Form Edit a one-time facility or can I edit the details in the application form as much as I can? I edited my form but still there is a mistake which I didn’t see.. can I make changes again.. the problem is of English or Hindi medium.. I AM SIDDHANT YADAV ,TODAY WHEN I WAS TRIED TO DOING CORRECTION IN MY APPLICATION FORM .I HAVE FACING PROBLEM like your request for correction in ctet 2018 application form has not been submitted successfully.there is another application form exist with this information. i want to change my Medium as hindi to English medium. but correction option is not available.what to do???? I have corrected my form on today bt I HV filled wrong state and district of my B.Ed college can I again do correction? Can I re-edit the application. Because I have filled the wrong option by mistake. I wanted to fill ctet 1to 5 paper and I was to choose option 6 but I filled option 4. Please sir tell me about this if u have any solution for this. Sir Maine level 1 or 2 k liye correction period m fees to submit kra di pr cafe vale ne meri qualification details wrong fill krke form submit kr diya . Ab dobara option show nhi ho rha for correction of qualification details. Plz tell me how I correct this. yes Nidhi you can edit the form. Sir I have made correction in ctet form once..but still there is mistake in my qualification.. so can I re edit the form ..because the form is not getting re open for correction .. So if their is any possibility..plz tell me about that procedure ..
Sir Maine e mail id ka gmail k badle gmil type kr di baki aur sabkuchh name sab thik hai aur mail lD Mai edit nhi kr sakta ab Kya hoga? Aage koi problem hoga sir..
Sir, when is the last date for online form correction ? Is it today? I mean 10th or 15th Sept. ..? Ctet correction form submit hone k baad dobara correct Kar sakte haen? How can we edit the form again.. no option is coming after logging in..
Dear sir I have corrected my form and also I have paid the additional fee of Rs. 500 to select the paper 1 also. But sir by mistake I have selected wrong minimum qualification fir class 1-5 and I have final submitted the form. Plz help me sir if there is any way to re- edit the form again.. Yes you can edit your ctet application form. The correction window can be accessed from September 06 to 15, 2018. You can edit your ctet application form, but once you edit your form and submit that successfully then you can’t edit your application form again. The correction window can be accessed from September 06 to 15, 2018. You can Edit your CTET application before 15 September 2018. Agar aapne ek baar form edit kar k submit kar diya to aap dubara edit nai kar skte. Centres change nai ho skte. Ek baar jo centre declare ho gya vo dubara change nai kr skte. Once you submit your application form then you can’t edit your form again. The Last date to made correction is 15 September. Once you edit your form and submit that successfully. Then you can’t edit your application form again and if your form is not submitted then you can make changes in your application form. but sir there is no any option to edit again. Plz help me sir. Once your application form is submitted then you can’t edit your form again. If your form is not submitted then you can make changes in your application form. Agar aapne ek baar edit kar k apna application form submit krva dia hai to aap ab dubara apna application for edit nai kar skte. You can change exam centre in your application form. The last date to make changes in 15 September. The facility to edit the form is provided only once. You can edit your application form only in one time. Once your form is submitted then you can’t make changes. If your is submitted successfully then you can’t edit your application form again. You have to contact officially as soon as possible. I applied for CTET LEVEL II but after correction I filled Level I .I submitted the form.But I want to apply for level II also. How can I edit my form.please help me.I applied for KVS in TGT behalf of CTET LEVEL II.But now I can’t take exam for level II. What to do. Sir mene 2nd level fill kr dia but m 1st level fill ni kr payi to kya correction m 1st level m bhi apply kr skti Hu..
Agar apne ek baar edit kar k apna application form submit karvadiya hai to dubara aap koi changes nai kar skte. Agar apka form submit nai hua hai to aap apne application form main changes kar skte hai . The facility to edit the form is provided only once. If you done your changes in your application form and submit that successfully then you can’t make any changes again in your application form. If you have not submit yet then you can make changes in your application form. I have filled ctet for both paper but now I m unable to edit, it is showing either not registered or incorrect details.., anybody can please help me out? Sir pls help me edit form aur extend hoga kya..mene edit form me correction nahi karpaye me exam depaungi kya? Once your application form is submitted successfully then You can’t make any changes in application form. Sir,,, meri E.mail id glt ho gai hai to isse koi effect padega ya ni ….. Yes farak pdega because jo bhi information hai vo apki mail pe aaye gi. The facility to edit the form is provided only once. And you can’t make any changes now because the last date for make changes is 15 September. The facility to edit the form is provided only once. And now you can’t make any changes in your application for because the last date to make changes is 15 September. Sar meri date of birth wrong h .
Hello…….now when admit card is available.my registration no. Is invalid then I noticed that in the form ,I entered wrong gender….What can I do.????? I have wrong DOB on admit card. So can i give the exam or anyway to change the DOB. Sir,my gender converted to MALE instead of female..I hv contacted so my times in CTET official pH no and emails..but there’s no reply..
So.,can I sit the xm or not? by mistake i forget to enter my father last name n correction time is over .What should i do now ? You should contact the officials for this. Sir Maine ctet 2018 clear kar liya par ctet ke application form mai mere diploma ki percentage 68% h. Jabki d.ed ki marksheet mai 68.68% h.aage jab ctet ki marksheet verify hogi to koi problem to nhi hogi. I have filled wrong subjects in paper 2. Is this possible to correct them for ctet 2019. Please suggest me..
sir my sister Gender is female but mistaken to submitted male then i will change to female ? I want to confirm that is it possible to change the subject in ctet form from social science to maths and science? I want to ask that is it possible to change the subject in ctet form from social science to maths and science? Yes, you can change the subject, while the correction period. I hope you have got your answer. During the correction period of CTET 2019 Application form, you can change the subject as per your wish. I have filled ctet 2019 form and i think kuch mistakes ho gyi h..
1. Me mdu rohtak university se b.ed kr rhi hu and qualifying exam ki details me mdu rohtak ka pin code galti se wrong fill kr diya.. kuch problem hogi kya aage?? 2. B.ed final year me hu to appearing status h but first year ke marks bhi fill krne the kya?? 3. B.ed 2 year kr rhi hu but minimum qualification details me 2 year b.ed ka option nhi tha and passed or appearing in 1 year b.ed wala option choose kiya h.. toh aage problem hogi kya???? Plz tell me.. plz clear my these doubts.. I will be thankful to you.. Sorry, but you can’t change the Aadhaar Card number, in the correction time the candidates can’t change all the fields, only some of the fields are editable. It is possible to change the subject in CTET, while application form correction. You can change the subject of paper II. You can correct the wrong details in the application form by doing corrections when the CBSE opens the correction window.